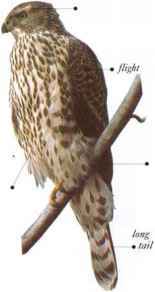 A large relative of the Eurasian Sparrowhawk, this bird lives in mature, tall forest. It hunts in forests, at the forest edge, and in adjoining areas of open country. 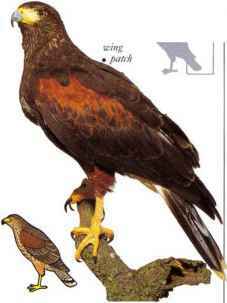 Its main prey arc birds in flight. The Goshawk either flies low, taking a bird by surprise, or watches from a high perch in a tree and swoops on its victim. I'rey includes crows, jays, pigeons, thrushes, grouse, pheasants, squirrels, and rabbits. 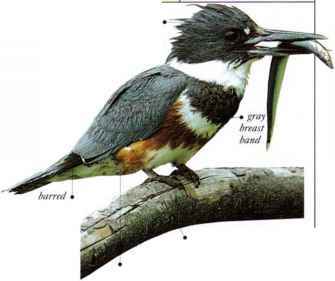 • NEST A platform of twigs and sticks, lined with bark, smaller twigs, and feathers, built in a tree. • DISTRIBUTION Breeds in North America, Eurasia and N. Africa. Northern populations migrate south. • REMARK Females are larger than males.